Interested in a new place to buy supplies for your Mini-Picasso or Crafting Diva? 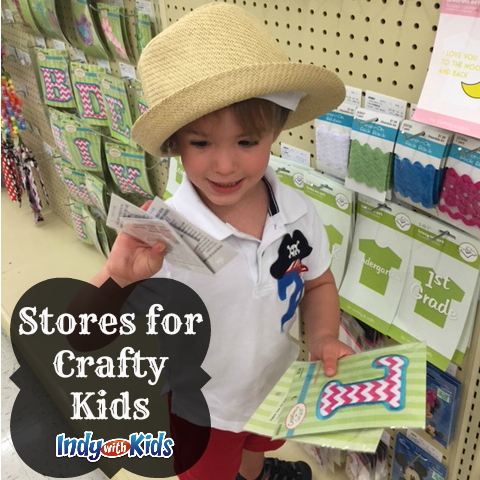 While we love Hobby Lobby (perfect for decor and seasonal crafts), Michael’s (great sales and coupons), and JoAnn Fabrics (wonderful selection for fabric crafts) Indy has more to offer by way of craft stores than just well-known chains. Check out these area supply stores that are bound to have whatever it takes to bring your artist’s vision to life. Prizm, The Artist’s Supply Store (8607 Allisonville Road, prizm.patcatans.com) offers an array of fine art products and boasts affordable pricing as well as price matching. This is the perfect location for a budding artist who specializes in drawing, painting, or sculpting with clay. Prizm sells professional quality items as well as items for the less-serious artist. Woodcraft (7330 E. 86th Street, Woodcraft.com) carries anything you could possibly need for a craft or project using wood. They also sell plans and materials for projects ranging from a tiny reindeer ornament to a full-sized bedroom armoire. Woodcraft is the place to go for specialized hand tools and workshop accessories that aren’t easily found at the hardware store. If your young artist loves to create with beads you need to head to Heirloom Classics Jewelry and Beads (1311 Prospect Street, www.heirloom-classics.com). Heirloom Classics sells beading and jewelry materials in addition to custom jewelry pieces. They offer a wide assortment of classes related to jewelry making including beading, silversmithing, and glass fusing. For multiple interests, multiple kids, or just getting ideas I love United Art & Education (5671 E. 86th Street, unitednow.com) and on the south side (7639 US-31). So much more than a teacher supply store, United Art has a wide variety of project materials, art supplies, and kits. This is the perfect place to stock up on activities for rainy days or find a new interest for young ones in need of a hobby. With their great selection of educational toys and games it’s also the perfect place to grab some gifts for upcoming birthday parties. They also offer shipping.